The world-famous town of Madonna di Campiglio is one of the most elegant resorts in the Alps. A very fashionable and prestigious resort meets the highest requirements - from luxury hotels to well-prepared ski runs. Here you can enjoy the most beautiful scenery and the purest Alpine air, and plunge into the atmosphere of the true winter fairy tale! This place revives our childhood fantasies about a magical land where gnomes and enchanted princesses were living. The resort has everything for the most demanding tourist, an excellent infrastructure will satisfy needs of everyone. The resort is suitable for tourists of all ages and with different levels of skiing. Madonna di Campiglio is a family resort, where for dads - black pistes and a delicious meal, for moms – good shopping, for kids - kinder gardens and parks, and for all the tourists - incredible beauty of nature and a lot of fun. The ski resort of Madonna di Campiglio is located in the north-east of Italy, in the region of Trentino, in the valley of Val Rendena. This is the territory of the national park Adamello-Brenta, one of the largest in Europe, which is included in the UNESCO heritage list. Enjoy the wonderful natural landscapes of amazing beauty here in the territory rich in lakes, waterfalls, alpine meadows and forests. The resort of Madonna di Campiglio is completely surrounded by the Alpine Dolomites. As the saying goes it is better to see once than to read large colorful descriptions. How to get to the resort, see it below. Alps2Alps offer the most beneficial transfer services to the resort of Madonna di Campiglio. It does not matter when you are going to rest - during the peak season or at the end of the season - we will provide reliable, comfortable and, no less important, the lowest-cost transfer for you, your family and friends to the Madonna di Campiglio. We provide large discounts for the midweek. If you want to save on transfer, know that the most beneficial offer is a trip in the middle of the week. From Monday to Friday Alps 2 Alps is ready to offer a transfer with a discount up to 60%, than on weekends. The calculation of the cost of your transfer will also depend on such factors as the vehicle availability, transfer schedules, vehicle utilization and other costs as toll roads and parking charges at the airport. If you plan to travel in a large group and you have any wishes, please contact us to discuss the possibility of your transfer. The resort of Madonna di Campiglio is situated above 1,500m with the maximum elevation of 2,500m, skiing and snowboarding is assured throughout the season. At your service are 150km of connected slopes for skiing from Madonna di Campiglio to Pinzolo, in the largest ski area of Trentino. 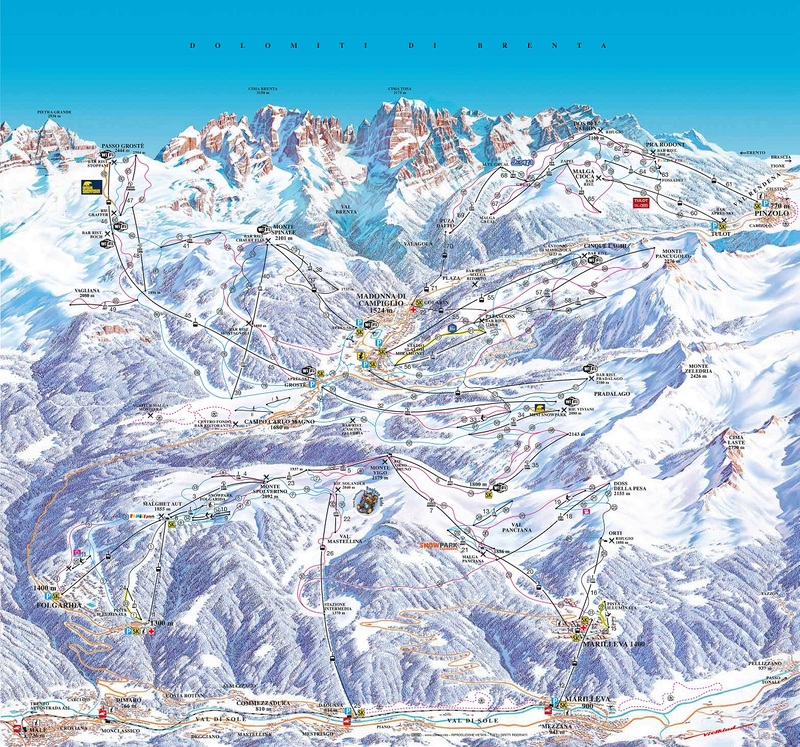 Madonna di Campiglio has a lot of ski runs where you can try yourself. From first-timers to seasoned pros, everyone can choose his best ski run there. Spending their holydays in the Madonna di Campiglio resort all the little travellers will not be left without care and attention. The families with kids are always welcome here. The ski schools of Madonna di Campiglio have at your disposal more than 500 professional ski instructors, that teach you and your children how to ski properly thanks to the ski lessons. Alps 2 Alps will guarantee you the most quality transfer services with maximum level of comfort and reliability with the lowest prices during the whole ski season! â—Â Our Customer care friendly and professional team on-hand 24\7 - call any time! Let your trip be nice and comfortable from the very beginning! As you know, as the high-season is coming, the prices for all the best transfer services to popular destinations are growing up fast. To be sure of your holiday we advice you to booking your transfer to Madonna di Campiglio the most early possible. If you can't find any information you needed, the resort or some service, just contact us. Our team will do the best to help you according to your wishes and preferences. Choose Alps2Alps to ensure your perfect holiday start!